In any telescope system the objective — even when made up of several elements, both converging and diverging — must always be converging as a whole. The Galilean and the Keplerian telescopes thus differ only in the eyepiece, which is diverging in the former, converging in the latter. The Galilean telescope (fig. 1) consists of a converging lens (plano-convex or biconvex) serving as objective, and a diverging lens (plano-concave or biconcave) serving as eyepiece. The eyepiece is situated in front of the focal point of the objective, at a distance from the focal point equal to the focal length of the eyepiece. 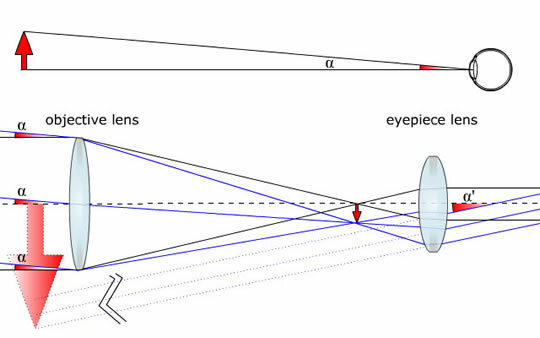 Since converging lenses are conventionally positive (or of positive optical power) and diverging ones negative (or of negative optical power), we can also say that the distance between the objective and the eyepiece is equal to the algebraic sum of their focal lengths. The negative eyepiece intercepts the converging rays coming from the objective, rendering them parallel and thus forming, to the infinite (afocal position), a virtual image, magnified and erect. The magnification of the system is determined by the ratio between the focal length of the objective and that of the eyepiece. The Galilean telescope, although it furnishes erect images with the aid of erector devices, has the severe drawback of an extremely narrow field of view (which makes it, in practice, usable only for magnifications up to around thirty). 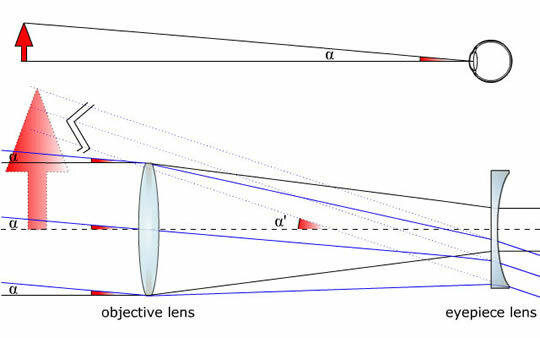 The principle of operation of the Keplerian telescope (fig. 2) is relatively simple. The objective forms a real image, diminished in size and upside-down, of the object observed. The eyepiece — which, consisting of a converging lens with short focal length, is actually a magnifying lens — enlarges the image formed by the objective. The image observed is however upside-down, so that the Keplerian telescope, at least for terrestrial use, must be fitted with some kind of erector device which, by inverting the image again, erects it. But this disadvantage is amply compensated for by a much greater and more evenly illuminated field of view than that of the Galilean telescopes.